Ford Country Squire dominated America’s roads and some wagons could be ordered with Cobra Jet V8 engines. In our days, a station wagon would certainly not be picked by those people who favor powerful or eye-catching cars. 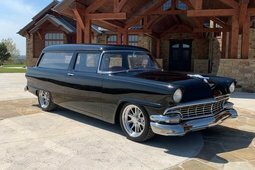 However there was the time when station wagons were sought, not just for their capability to easily transport trophies after a successful hunt or to move furniture, but also for their extraordinary design solutions and their power-packed engines. The American muscle wagons had all of these features. In the USA, the mass production of modern station wagons started in the fifties when metal replaced wood as the body material. This was accompanied by a change in their image: before then, station wagons, despite being spacious and practical vehicles, were mostly considered as the choice of farmers. 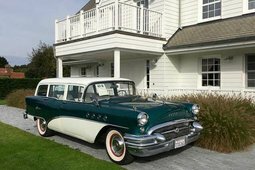 Then, various models of station wagons from leading manufacturers made their debut, many of which were quite refined and packed with a range of equipment. This was the manufacturers' response to the new market demands. Following World War II, about 4 million babies were born each year in the US. This meant that families were in need of larger cars. Accompanying this was a critical shift of perspective: once a symbol of luxury, the car became a necessity. American families quickly fell in love with the station wagon as a trendy and modern car that could put the entire country within their reach. As a result, the US market share of station wagons increased from below 3% to almost 17% in just a decade. However, the manufacturers had ideas for pushing this segment to an entirely new level. At the onset of the seventies, the US car manufacturers started their quest for unprecedented power. Casting economy aside, they installed powerful engines into coupes and cabriolets, thus inventing a new "muscle car" segment. 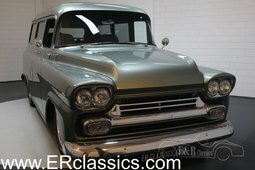 The essential features of these muscle cars were large engines and sporty accents. Besides their hair-raising roar, these cars promised a thrilling driving experience. Could the station wagon evoke similar emotions? Of course! 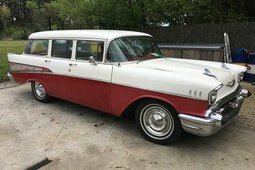 As long as it is an American muscle wagon - a symbol from the golden era of station wagons. 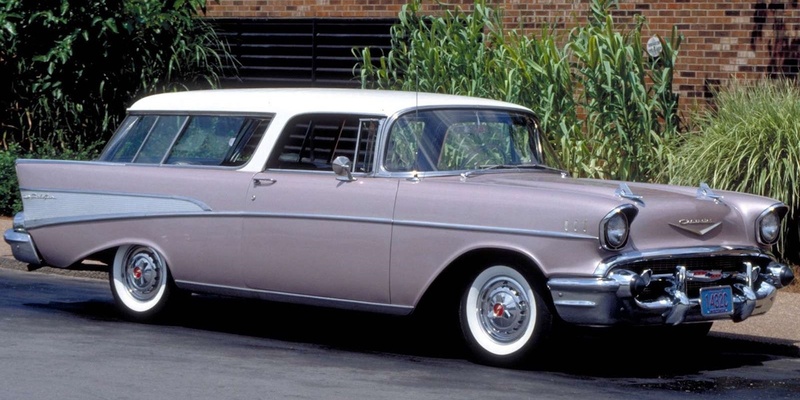 If we are to remember the most memorable American muscle wagons, we should start with the progenitor - the Chevrolet Nomad with its signature sharp lines. It was manufactured in Bel Air and was created by Harley Earl, the legendary designer from General Motors. Produced in 1955 through 1972, this model won over families with its ample space and melted the hearts of enthusiasts with its thrilling power and aggressive design. The early Nomads that were made before 1957 were quite short in length and had just two doors, which made them stand out from the crowd. There was a selection of several engines installed in them, the most powerful being the V8, with a 283 hp engine. 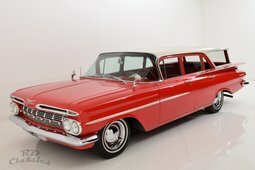 Interestingly, it was the most expensive Chevrolet produced in 1957 (with an initial price of 2757 USD), surpassing even the Bel Air cabriolet. 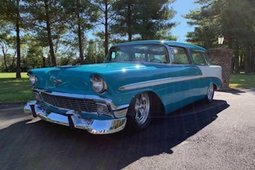 Therefore, it should come as no surprise that the Chevrolet Nomad models made from 1955 through 1957 (22,375 of them were made) are now sought by collectors as one of most valuable models in the entire history of station wagons. Their normal market price currently ranges from 50 thousand to 100 thousand USD. After 1958, the Nomad was designed as an ordinary four-door station wagon, which has resulted in a substantial price drop in the later models. The Oldsmobile Vista Cruiser is another impressive muscle wagon from that time. This was a spacious family car with a powerful V8 engine and with a slightly raised roof as an exclusive feature. It gave a unique experience both from the outside and the inside, as the passengers were able to enjoy the sunshine and the starry skies through its glass roof. Currently, the selection of Oldsmobile Vista Cruisers for sale is quite modest, and one can expect to pay 10 thousand to 30 thousand USD for a car in good order. The 2nd generation Pontiac Tempest that was made in 1964 through 1967 is yet another example of the muscle wagon philosophy. Its top of the range V8, with a 285 hp engine, made it the perfect choice for a family man with a burning need for speed. By the way, the Pontiac GTO, which was beyond any doubt the greatest among the legendary muscle cars, was based on this model. It is also worth noting that, according to unofficial sources, three station wagon versions of the GTO were manufactured in secret. While this is nothing but hearsay, the truth is that the Tempest station wagon and the GTO are closely related, although the latter packs considerably more power. Although these models were at the peak of popularity in their prime, now their value can be quite different: a well-maintained Tempest coupe or cabriolet can fetch tens of thousands of dollars; while a 50-year old sedan or station wagon can be bought just for a few thousand dollars. Another model that is worth mentioning is the iconic Chevrolet Chevelle. It came in many versions, including two- and four-door station wagons that were made from 1964 through 1977. 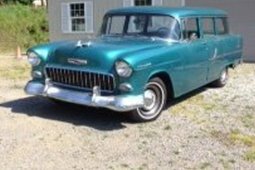 It was one of most popular American muscle wagon of that time, sporting a range of engines including six-cylinder and V8 engines (the 250 hp and 454 hp respectively). Ford also had something to offer its fans, and this was the Country Squire. A 5th generation model made from 1965 through 1968, it had famous versions with a Cobra Jet engine that was borrowed from the Thunderbird coupe: V8, 7.0 l, 345 hp. Given the fact that this station wagon could accommodate ten people, it really needed this power. Revived in the eighties, the Buick Estate immediately became regarded as special - it was one of the most powerful and fastest vehicles in the American muscle wagons segment. It showcased a gigantic 7.5 l, 350 hp engine. Its dynamic performance (it could accelerate to 100 kph in 8.5 seconds), unsurprisingly surpassed many purebred muscle car coupes and cabriolets. However, the golden era of muscle cars was soon to end, due to two important events that caused a dramatic reduction in the appetite for power: the adoption of more restrictive pollution regulations (in 1972); and the fuel crisis (in 1973). This meant the end for both muscle cars and for powerful station wagons. So, in the opinion of experts, there are not many collectible American muscle wagons, and all of them are made before 1971 (with the possible exception of the last Oldsmobile Vista Cruiser models that were made in 1972). This also heralded the sun setting on the entire station wagon segment, as in the nineties they had to make way for the new family favorites - the minivans.